Those scanners tear apart DNA and cause cancer! 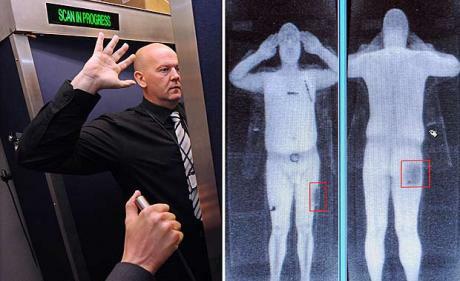 The world’s largest independent airline pilot association is warning its members to avoid security screening by full-body scanners out of concern the machines emit dangerous levels of radiation. The American Pilots Association, which represents about 12,000 pilots, is recommending members instead submit to new pat-down searches, even though critics have described them as “horribly invasive” and likened them to foreplay. The recommendation is based on concerns that, contrary to claims by the US Transportation Security Administration, the types of X-rays emitted by the machines could pose serious risks that still aren’t well understood. The pilots are by no means alone in voicing concern over the safety of the backscatter X-ray scanners, which are also known as advanced imaging technology. In April, radiation experts from the University of California, San Francisco, warned President Obama’s science assistant that the machines pose potentially serious health risks. Although the machines operate at relatively low beam energies of about 28keV, the radiation is delivered only to passengers’ skin and underlying tissue, the scientists argued in an April 6 memorandum (PDF) to John P. Holdren, assistant to the President for science and technology. While the dose might be safe if absorbed by the entire body, directing all of it to the skin only may be dangerous. The X-ray dose from these devices has often been compared in the media to the cosmic ray exposure inherent to airplane travel or that of a chest X-ray. However, this comparison is very misleading: both the air travel cosmic ray exposure and chest X- rays have much higher X-ray energies and the health consequences are appropriately understood in terms of the whole body volume dose. In contrast, these new airport scanners are largely depositing their energy into the skin and immediately adjacent tissue, and since this is such a small fraction of body weight/vol, possibly by one to two orders of magnitude, the real dose to the skin is now high. The scientists also warned that travelers might face health risks from malfunctioning machines or from overzealous screeners who raise the dose in an attempt to improve a scanner’s resolution. The APA and UCSF scientists join a growing chorus of critics of backscatter devices. Last week, the Electronic Privacy Information Center filed a federal lawsuit accusing the Department of Homeland Security’s TSA of unilaterally mandating the use of the machines as the primary security screening technique. By requiring government contractors to capture images of travelers’ naked bodies, the policy violates a raft of federal laws, as well as Constitutional protections prohibiting unreasonable search and seizure, EPIC argued. The Food and Drug Administration has published a response the the UCLA letter here.